Team claims fluorophore-bond RNA aptamer Spinach is brighter than GFP and resistant to photobleaching. 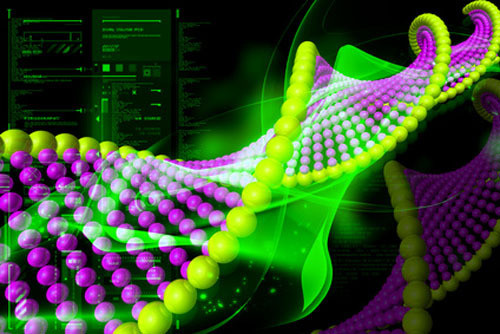 Scientists have developed the means to tag RNA with fluorophores that allows the nucleic acid molecules to be tracked as they travel through living cells. The Cornell University team claims their technique has generated a wide range of RNA-fluorophore complexes that glow in colors across the visible spectrum. The development of RNA sequences with GFP-like properties that exhibit fluorescence when bound to small molecule fluorophores has proven difficult due to issues associated with ensuring that fluorescence only occurs when the fluorophore is bound to RNA, the researchers note. Antibodies and aptamers capable of eliciting the fluorescence of conditionally fluorescent dyes have been reported, but most conditional fluorophores can also be activated nonspecifically or have other undesirable properties such as cytotoxicity. The goal of the Cornell team was therefore to identify a small molecule whose fluorescence could be activated by a specific RNA sequence yet not activated by other cellular constituents. Their starting point was the GFP fluorophore, 4-hydroxybenzlidene imidazolinone (HBI) and its relative 3,5-dimethoxy-4-hydroxybenzylidene imidazolinone (DMHBI). The researchers effectively designed RNAs that would bind to DMHBI and activate fluorescence, via multiple rounds of evolutionary selection. This resulted in the identification of RNA aptamers that when bound DMHBI, resulted in a range of different colors of fluorescence. By designing aptamers against two additional GFP-like fluorophores, 4-dimethylaminobenzylidene imidazolinone (DMABI) and 2-ydroxybenzlidene imidazolinone (2-HBI), the researchers were able to produce even more fluorescence colors. Characterization of the DMHBI-binding aptamers suggested that these complexes mimic GFP rather than enhanced GFP: EGFP glows more brightly as it exists almost exclusively in the phenolate (deprotonated), rather than the GFP-predominant phenol (protonated) form. To try and generate RNA-fluorophore complexes that exhibited spectral properties more akin to EGFP, the researchers designed a new HBI derivative, 3,5-difluoro-4-hydroxybenzylidene imidazolinone (DFHBI), which exists exclusively in the phenolate form and used a biomimetic strategy to obtain DFHBI-binding RNAs . One of the resulting aptamers (designated 24-2) exhibited an excitation spectrum consistent with exclusive binding to the phenolate form of DFHBI and which resulted in a molar brightness that was about 53% of EGFP, but brighter than many other fluorescent protein, the authors note. The aptamer in addition appeared to preferentially bind to the phenolate form of DFHBI, even at low pH conditions at which both phenolate and phenolic forms exist. Encouragingly, and unlike GFP, 24-2-DFHBI complexes, now renamed Spinach, exhibited negligible photobleaching and started fluorescing very quickly afer Spinach transcription in cells: in contrast, when GFP is used to tag proteins there is a delay in fluorescence because of the requirement for fluorphore maturation, they claim. Having confirmed that Spinach could be used to generate fluorescence in E. coli cells, the team then moved on to test when Spinach could fluorescently tag RNA in living mammalian cells. Human embryonic kidney cells were transfected with a construct comprising Spinach fused to the 3’ end of the small ribosomal RNA 5S. 5S-Spinach fluorescence was detected throughout cells, with a distribution similar to that of endogenous 5S in the same cell type. The researchers then treated the cells with a range of molecules impacting on 5S dynamics and were able to track 5S production and translocation between nucleus and cytoplasm as well as the clustering of 5S within granules in response to sucrose treatment. “We have described a palette of RNA-fluorophore complexes spanning much of the visible spectrum,” the authors conclude. “RNAs can be tagged with Spinach, providing a simple strategy for introducing a compact fluorescent tag for live-cell imaging of RNAs while avoiding the problems associated with current methods for tagging RNAs.